Have you seen these symptoms in your field? If so, please fill our our survey. Here, we are trying to understand the conditions that may affect this injury symptom. Figure 2. 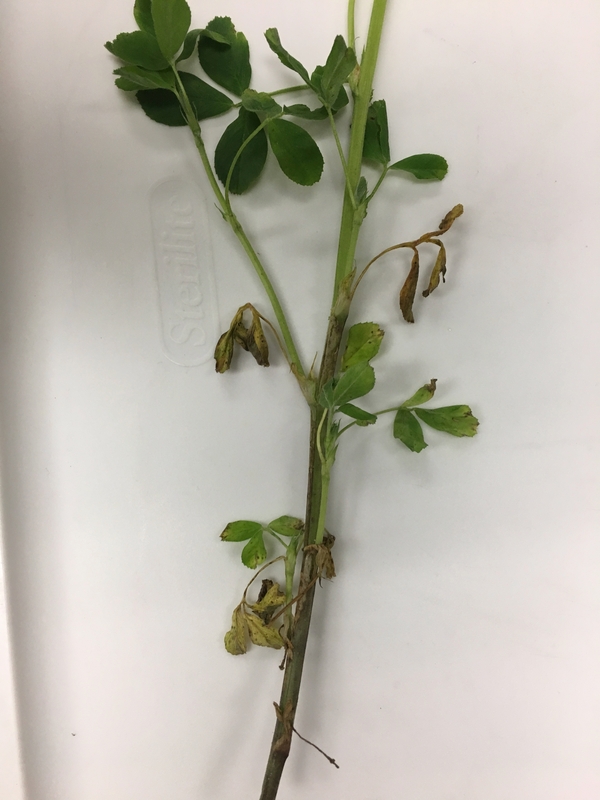 Shepherd's Crook symptoms in alfalfa after applications of glyphosate to Roundup-Ready alfalfa. 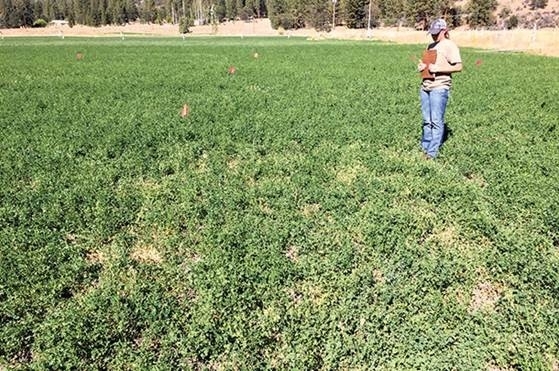 Perplexity took over when Steve Orloff, the deeply missed Siskiyou County's University of California agronomy Farm Advisor, was alerted by growers to a crop injury symptom in Roundup Ready alfalfa fields in the Intermountain region of California. He was the first identify the symptoms and described it in a blog on this site as "A Scientific Whodunnit"
RR Alfalfa is Largely Safe. 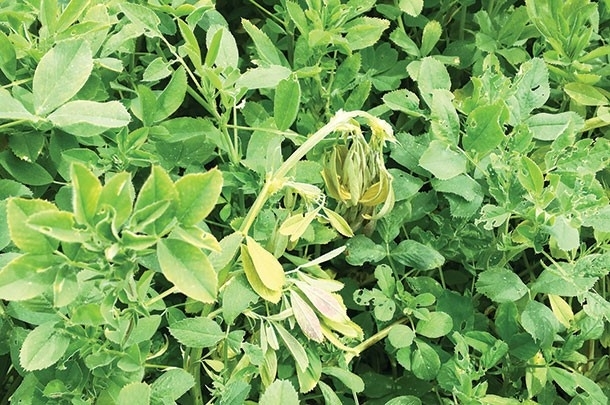 Roundup Ready alfalfa is a popular weed management strategy for alfalfa producers, and has been used successfully in many regions and controls a wide range of difficult weeds. Much of our previous work showed Roundup Ready alfalfa to be largely safe, but this injury was a new one. While Roundup Ready Alfalfa has some issues related to alfalfa hay exportation to some countries (primarily China), many growers are satisfied with the technology. Conditions for Symptoms. 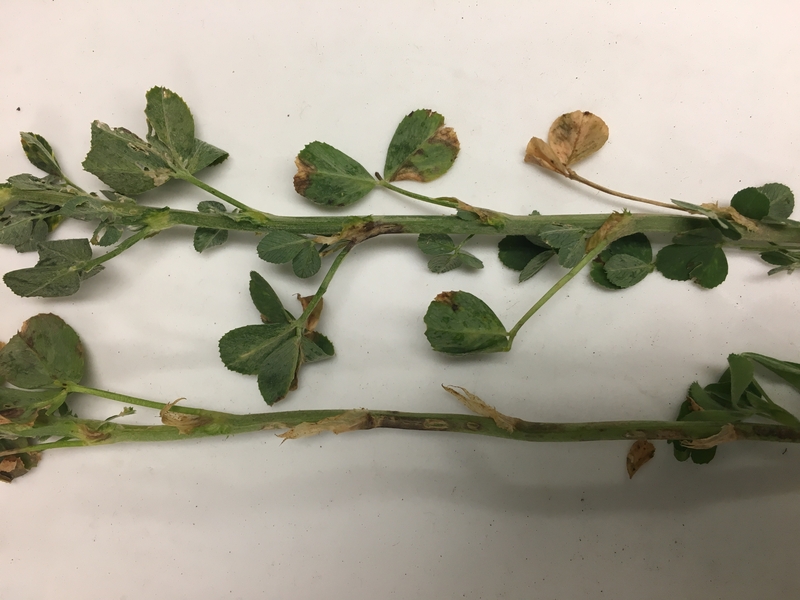 The initial cases of alfalfa injury were linked to freezing temperatures following glyphosate application to Roundup Ready alfalfa. Symptoms were then replicated in experimental plots at Scott Valley and the Intermountain Research and Extension Center in Tulelake, California. In both locations plants showed the “shepherd's crook” symptom, yellowing, and stunting that lingered until first-cutting. 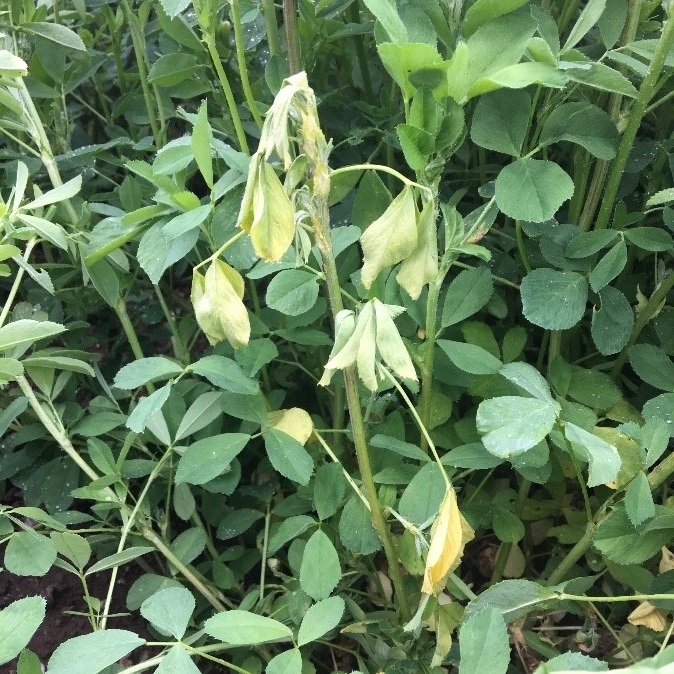 Injury symptoms were patchy and non-uniform and it was determined the injury was not caused by spray tank contamination or a bad batch of glyphosate. 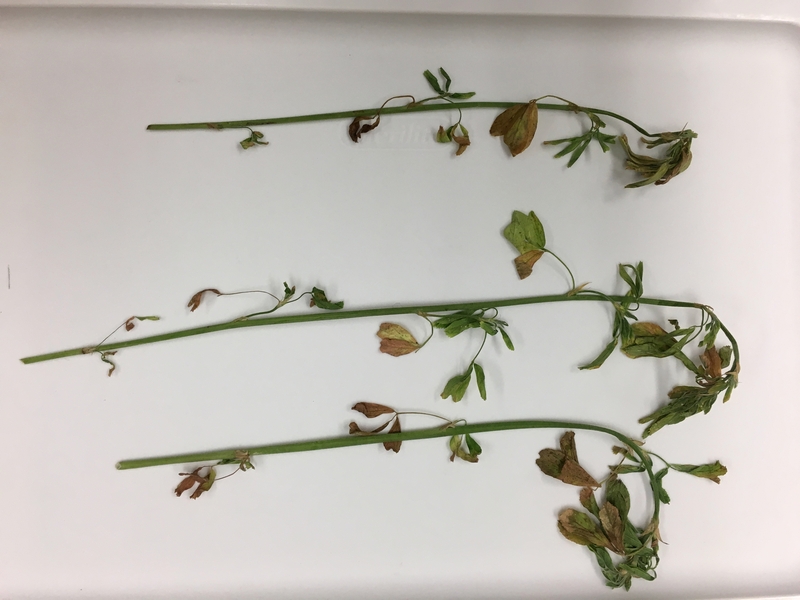 Spring injury symptoms did not linger into later cuttings, and injury symptoms failed to develop when temperatures were above freezing following glyphosate application. What is causing this? 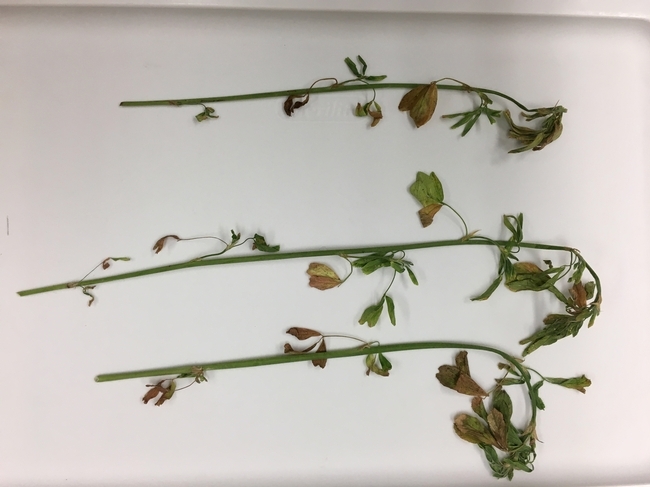 As this scientific story was developing, a puzzling aspect was the injury was non-uniform in the field and did not fit the typical symptoms of glyphosate injury. The injury was instead more similar to symptoms associated with a plant disease. 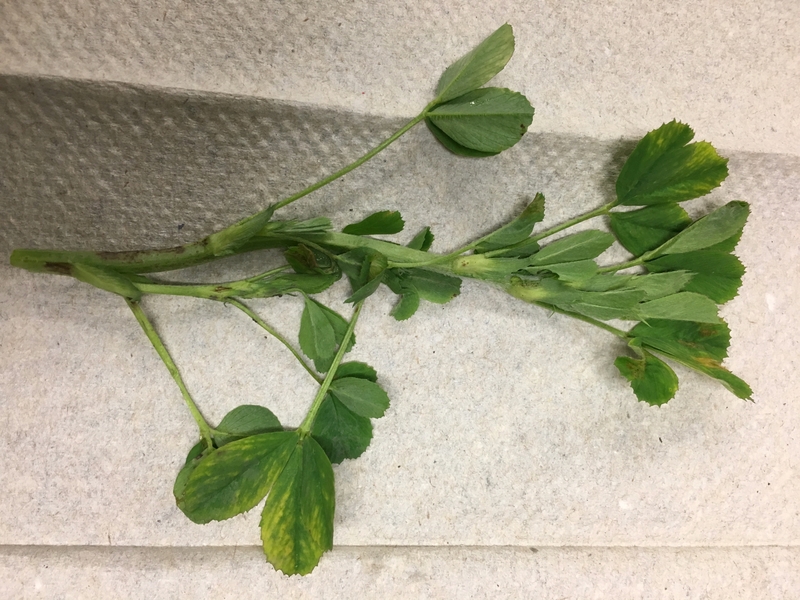 One possible organism that causes similar injury symptoms on alfalfa is Pseudomonas syringae. The waterborne bacteria is commonly found in natural and agriculture environments but it does not always cause damage to crops. However, it is regularly associated with frost damage because of a protein found in its outer membrane that mimics ice structure and works as a starting point for ice formation. Whether the alfalfa injury is solely caused by the combination of glyphosate application and cold temperature or if P. syringae is also part of this mystery is yet to be confirmed. For future research, we need to learn more about the extent of this problem, areas where similar crop damage is happening, and the timing of glyphosate application and crop development at application. Figure 4. 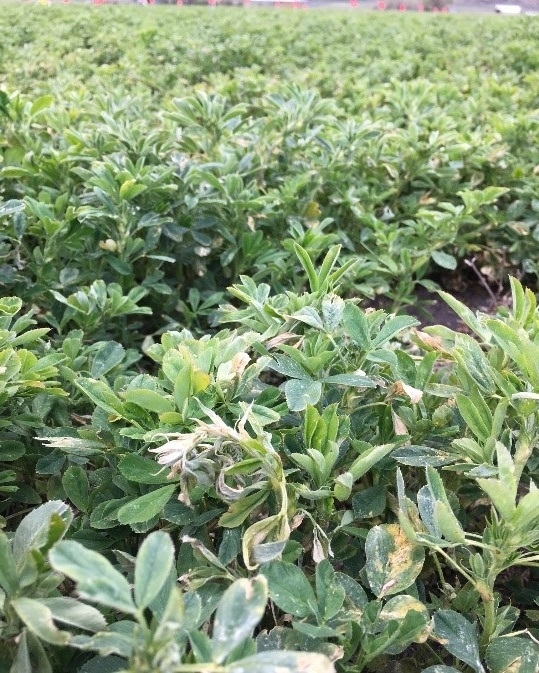 Field symptoms of glyphosate injury in Roundup-Ready alfalfa. IF YOU HAVE SEEN THESE SYMPTOMS, PLEASE FILL OUT OUR SURVEY SO THAT WE CAN LEARN MORE ABOUT THE CONDITIONS THAT CAUSE THIS PHENOMENON. Figure 5. Symptoms. Dead leaves and curled top. Figure 8. Stem lesions and leaf water soaking.